Every day at nap time I take a walk to lull Merritt and Roscoe to sleep, but if that doesn't work out we end up cruising in the car instead. Either way I look forward to the time because it guarantees at least an hour to obsess over the amazing Christmas decorations that trim the houses here. They are quite over the top. My favorite trend is the magnificent wreaths adorning the front doors. Each one is meticulously detailed and emulates the spirit of each home. They are color coordinated, of course. I snapped pictures of these as we walked on Monday, and this isn't even all of them! Wow pretty!! I love all the brick houses too. Love th epics. You've been pinned! 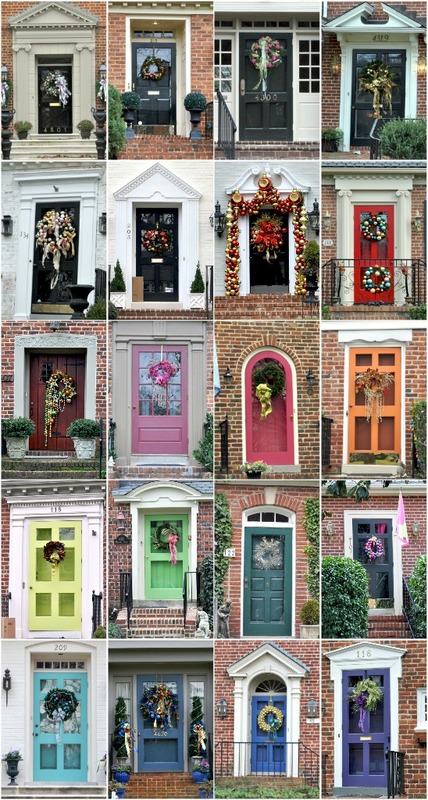 The wreaths are beautiful, but even more impressive are the doorways in your neighborhood! I love the detailed architecture and colorful doors...so much character! That's the beauty of living in an older town I suppose. Our neighborhood was built around 20 years ago, so all the doorways and homes sort of look the same. But I loved looking at the architecture of the older buildings when we lived in Boston.